You know how our Food Guide includes chocolate milk as a milk source (see photo up above)? And how that inclusion leads school boards, health organizations and health professionals to defend chocolate milk's consumption? And how that defense often leads to statements that suggest without chocolate milk, kids won't drink milk? As chef Anne Cooper has noted, that's as nonsensical a message as stating without apple pie, kids won't eat apples. Well one Edmontonian grade 4 class is having none of it. They've actually gone and started their own blog, The Milk Revolution. They've launched their blog in order to try to help their school reduce chocolate milk consumption by 60%. 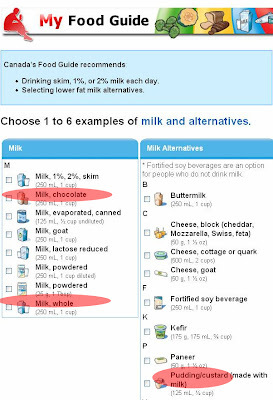 So I've got to ask, why is it that Grade 4 students can muddle through the concept that beverages with 3.5 added teaspoons of sugar aren't beverages schools should be serving their students, while Canada's Food Guide explicitly includes chocolate milk as one of their recommended dairy choices? "I'm no expert, but it doesn't take a genius to figure out added sugar isn't making a drink healthier. Kids have figured it out, what's wrong with the grownups?" Kudos to Mrs. Swelander's Grade 4 class.